Three Great Tips from Instructors! Welcome to the first edition of Sound Bites! We’re excited to launch this monthly newsletter to keep you abreast of exciting new classes, workshops and career training opportunities. But it will be more than that. We will also include helpful tips from instructors on topics ranging from fitness to gardening. We’ll profile interesting teachers and students. We’ll give you a look at what we believe is a rich and fascinating world, a college-within-a-college filled with interesting people, new adventures, acquisition of new skills and opportunities to enrich – or even change – your life. We believe that SMC Community Education is not only for learning, but for making dreams come true – whether it’s a new career or skill, a new garden you create, new travel adventures, or learning a new language. We also believe that this newsletter might spark an interest in a class or a field you never would have thought would attract you. We welcome suggestions and feedback for our classes and our newsletter. Please email us at commed@smc.edu or call us at 310-434-3400. Get a 10% Discount When You “Like” Our Facebook Page! 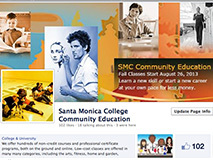 Get a 10 percent discount on on-ground classes just by “liking” the new SMC Community Education Facebook page, and mention it when calling to register. The Facebook page is part of Community Education’s exciting new makeover that seeks to reach out in a more personal way to its “family” – students, instructors, and staff. So, if you haven’t done so yet, discover the sense of community you will find by signing up for classes. A few began last week, but most of our classes, workshops, special tours and professional development courses have yet to begin. Nearly 200 low-cost classes – far less expensive than UCLA Extension – are on tap this fall in a variety of categories, including the arts, home and gardening, social media, languages, real estate, computers, fitness, money management, and much more. Classes are offered on the ground at convenient locations and with free parking. Comprehensive SAT Prep as well as College Writing Prep & Writing for the SAT – classes that are designed specifically for SMC Community Education and are different from the prep courses offered elsewhere. Holiday-themed classes for families and friends, which includeholiday card-making workshops (Halloween and more) and are kid-friendly and great ways for parents and children to spend time together creating memories. In addition, Holiday Shopping in Historic South Pasadena is a brand new tour. Photographing at a Museum: Fall at the Getty Villa, which will take you to the breathtaking Roman-style villa in Malibu. You will spend the day meandering through this gorgeous property by the Pacific Ocean while learning how to take awesome pictures inside an art museum like a pro. A special pre-booked tour will end the day with a special look at the Roman Garden and Architecture. Many exciting new jewelry-making classes, which are great opportunities for handmade presents this holiday season. great opportunity to get in on the housing market in 2014. A new intensive one-day workshop on Basic Bookkeeping and three-week Intro to QuickBooks Pro, both of which will allow you to get a handle on the business of bookkeeping in no time. The Business of Bartending, a three-week course that will give you a great opportunity to pick up quick cash or develop an exciting side gig. In addition, a wide range of Professional Development courses are designed for students to acquire marketable skills in a very short amount of time. “We are so excited to begin Fall 2013 not just because of all the new offerings we have in store for the public, but also because of the debut of our monthly e-newsletter and Facebook page to keep the community members connected and informed of all the learning opportunities we provide,” Meyering said. To register, call (310) 434-3400 or go to http://commed.smc.edu. drug dealers and crooks on his South Central beat. he found meaning in his life through rescue work. Why do students sign up for memoir writing? Most students come to class with a story they’ve been sitting with for a while and they feel compelled to get it down on paper. It might be about a loss, or a transformative life experience, or even just wanting to write down their childhood experience, something they can pass on to their children and grandchildren. My students are of all age ranges – from teenagers to octogenarians. Many just come out of curiosity because they want a creative outlet and discover that they have lots of untold stories. What do they get out of the class? My goal is three-fold: Students come with the raw material of their life, and I want to give them tools to help them shape a story from it. I want to get them thinking like writers and asking questions of their material that will help them craft a better story – questions such as: are there enough details and description, have I created three-dimensional characters, is the narrator believable, is there an arc to the story, etc. The second goal is to create a safe space for students where they can write and share their experiences without fear of judgment (including their own inner critics – sometimes the harshest of all). Students have to read their work out loud and that is not easy! What they don’t get is therapy, although the act of writing can be very therapeutic. What students get is real attention and focus on their writing. I also hope that the class gives them a community of writers – writing is such a solitary act and it is important to be able to connect with other writers who all speak the same language. What are the rewards of teaching this particular class? I am continually amazed by people’s life stories. Teaching this class has made me a more compassionate person. I find myself full of admiration for what students have endured and for their resilience and capacity for growth. One of the big rewards is to see students grow as writers – to see them embrace the process and feel good about it and want to continue with it. You also teach older adults at SMC Emeritus College and – at the other end of the spectrum – incarcerated youth. Tell us about those experiences. Teaching older adults is really wonderful – they are enthusiastic learners, and they bring such wisdom and life experience – I often feel they are teaching me. The students at Emeritus College are so special – they’ve lived through so much history, both world and personal. I’ve had students write about the Holocaust, WWII, the civil rights movement, the age of radio – the diversity of experience there is mind-blowing. At the end of every class, we all feel so enriched and enlivened and so bonded. With the incarcerated youth, it’s a different set of challenges – they have had so few positive experiences with learning, and mostly they’ve been told they have no value as human beings – so you have to break through a lot of barriers to get them to trust that what they have to say is valuable. So many of them have experienced such unimaginable trauma – shootings, deaths of loved ones, and all the hardships of growing up poor and disenfranchised. Yet, they have to learn to take responsibility for their lives. I’ve been teaching teenage boys for the last two and a half years, and I find they are incredibly vulnerable; some of them have such amazing writing skills and don’t even know it and all of them have something important to say. Creating a safe, loving space is all-important, because it’s so easy for them to shut down. Many times I feel I’ve failed them utterly, but then we’ll have an amazing class and they write their hearts out and it is so moving. Tell us about some of your other students. Here’s an example of a student who walked in to my memoir class at Continuing Ed – he’s in his 80’s, a retired cop – he had worked in the LAPD from the 40’s through the 60’s – mostly in South Central, and he thought he should write down his experiences for his grandchildren. He took the class over and over, for at least three years, and wrote the most interesting stories about Los Angeles, and being a cop. What became clear as he told his stories was that, as a cop, he had tremendous compassion for the community he worked in – hookers, drug dealers, drunks, thieves, crooks – he saw them all. He writes about people in the most humorous and sympathetic way – he had no writing experience at all, and by the end he had written a memoir in the most enjoyable prose. He certainly destroyed any stereotypes I had in my head about the LAPD. I had another student, a man in his 40’s, who just wanted to try his hand at writing, and casually mentioned, as a side note, that he had been deployed by the Red Cross to NYC in the aftermath of 9/11. We all said to him, wow, you should write that story – he had no intention of doing so. He ended up writing a whole memoir about that experience, how he became involved in the Red Cross, and how, by doing rescue work, he went from being a lost soul to finding real meaning and purpose in his life. I’m keeping my fingers crossed that he’ll find a publisher for his book. Another student who had no intention of telling her story found a whole memoir out of it – she grew up in Ohio in the 50’s and her mother was taken away to a mental institution when she was very young – this in a time when no one really talked about schizophrenia or mental illness. She has become such a good writer and is telling a story about both a moving personal experience and a fascinating portrait of America in that time. That’s what I love so much about memoir – it’s personal history intertwined with the history of the times. You also teach creative writing and short fiction classes. How does teaching those classes differ from the memoir classes? In terms of teaching the craft of writing, it is pretty similar. Whether you’re writing creative non-fiction, or fiction, you still have to pay attention to the same elements of the craft. The demands of each genre are different, but the way we talk about writing is essentially the same. I was fortunate that my film projects, shorts and documentaries, were well received, but the world of feature film making, which is where my ambitions lay, is and was a very tough one to break into, particularly for the kind of films I wanted to make. I tried for many years to get feature film projects off the ground without success. Writing became a creative outlet out of frustration of not getting films made, but then I fell in love with fiction writing — my first real introduction to it was in a class at SMC taught by the wonderful writer and teacher Jim Krusoe — and so I was quite happy to leave the film world behind. Is there a common thread that emerges in your film and fiction writing? 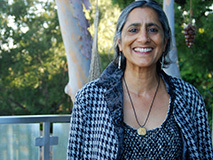 Monona Wali began her professional career with an M.F.A. in film production from UCLA Film School where she was awarded the Lynn Weston Memorial Scholarship for an outstanding female graduate student. Her thesis film, “Grey Area,” was recently screened at the Hammer Museum as part of its Festival of Preservation and has been included in the travelling exhibit of the L.A. Rebellion film series. In 1992 she was selected to work with an exciting team of creative voices including Peter Sellars, David Henry Hwang and Gregory Nava to develop a series for PBS about the immigrant experience entitled “East Of Western.” She co-directed and edited “Maria’s Story” a first-person account of a guerilla leader in the Salvadoran Civil War. “Maria’s Story” received national airing on “P.O.V.,” the award winning PBS documentary series, in 1992. “Maria’s Story” also received the Blue Ribbon Edward R. Murrow award at the American Film Festival, among many other awards. In 1988, she began her second career as a fiction writer, taking classes at Santa Monica College with the legendary teacher Jim Krusoe. Her stories have been published in The Santa Monica Review, Catamaran, A Journal of South Asian American Literature and other literary journals. A recent story, There Is A Certain Kind of Woman, won the Wordstock 2011 Short Fiction Contest judged by Aimee Bender. She is currently working on a collection of linked short stories, “The Greenest Country,” about an Indian family. She has served on several boards including Beyond Baroque, a literary arts organization, and The Wildwood School and was President of the Board of Trustees of the Waldorf School of Cape Cod. She was awarded a work-study scholarship to Breadloaf Writer’s Conference, and was selected for a workshop with Michael Cunningham at the Fine Arts Work Center in Provincetown, MA. Monona Wali was born in Benares, India but grew up in the United States. In addition to teaching at SMC, she also volunteer teaches with InsideOut Writers, an organization that offers creative writing classes for incarcerated youth. She has two daughters, Kanchan, 23, and Maya, 20 years. Kanchan, a sculptor, graduated from The Cooper Union School of Art last year and is living and working in Brooklyn. Maya just finished her sophomore year at Barnard College, and is taking a year off before returning. Workouts: Always have some protein and be hydrated prior to your workout. Within 30 minutes after your workout consume some protein and hydrate again. A cup of milk, half a cup of Greek yogurt, or a handful of almonds will suffice. Stay away from Vitamin water or sport drinks since some are loaded with sugar. Gardening: Plant tender greens in October to enjoy all winter long. Lettuce, kale, collards, chard, and mustard greens all grow best in fall in Southern California. Clearing Clutter: Have lots of magazines? Gather them, look at each one and ask “Which ONE can I live without?” Cancel the subscription.